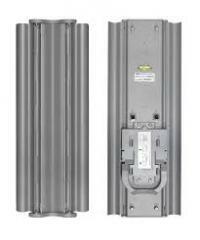 This high class 2x2 MIMO antenna offers highest performances, especially in co-location deployments. Antenna uses both - vertical and horizontal - polarizations which give the possibility to use highest possible datarates offered by 802.11n and airMAX technologies. Unique feature of Titanium Sectors is variable beamwidth which can be adjusted depending on implementation need (the gain of the antennas is variable also as it depends on the beamwidth). The antenna is compatible with Rocket M5, Rocket M5 GPS and of course Rocket M5 Titanium. Having adjustable beamwidth options enhances scalability and streamlines inventory. The airMAX Titanium Sector may be custom configured for any deployment requiring a 60°, 90°, or 120° sector. Antenna gain increases respectively with each decrease in beamwidth. Gain is 15 dBi at 120°, 16 dBi at 90°, and 17 dBi at 60°.